Earth has volcanoes — and Mars has volcanoes. Earth has actively erupting volcanoes — and Mars has... none. Or so it seems. Scientists point out that the Martian surface has more volcano-related rocks and features than Earth does. In addition, Mars is home to the largest volcano in the solar system: Olympus Mons, 600 kilometers (370 miles) in diameter, about the size of the entire state of Arizona, and 21 km (13 mi) high, over twice as high as Mt. Everest. 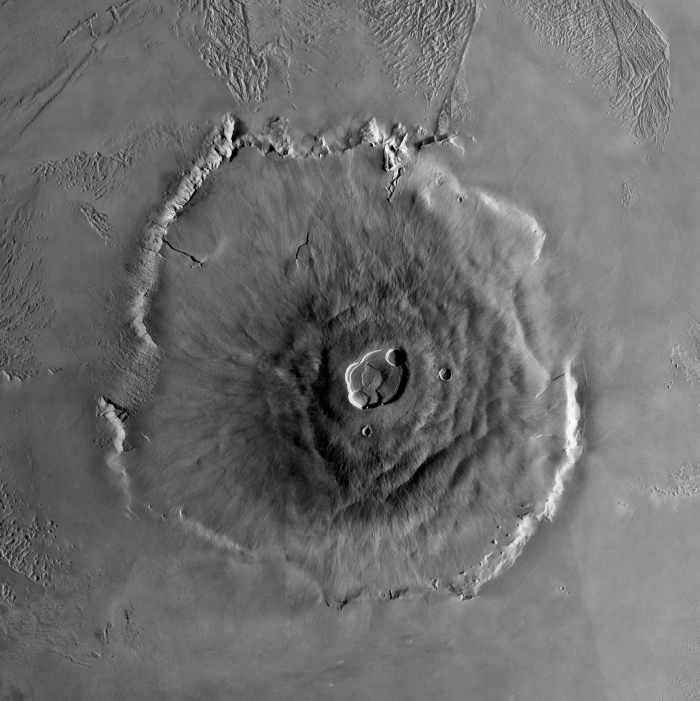 Olympus Mons is the largest volcano in Tharsis, a vast volcanic province with several other volcanoes not much smaller than Olympus Mons. Furthermore, Tharsis is not the only Martian volcanic center. There's Elysium, Syrtis Major, and a cluster of low-profile volcanic structures near the Hellas impact basin, to name the larger volcanic areas alone. It's clear that Mars has seen much volcanic activity in the past. But has its volcanism actually shut down? Scientists don't know because they are still just beginning to explore the planet. 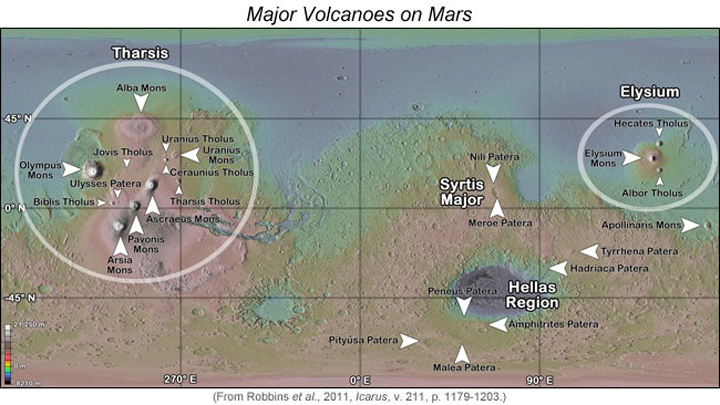 They can see that the slopes of the giant Tharsis volcanoes show only a few impact craters, which says that their lava flows cannot be ancient. Yet scientists can only guess how old they are in years. Ages estimated by the number of impact craters seen on lava flows go as low as a few million years. Here's a question to think about as you study Mars: If its last volcanic eruption occurred a million years ago, is Mars truly dead today? Perhaps Martian volcanic activity has ended permanently. However, it's also possible that we are simply seeing Mars at a geologically quiet moment, and activity may resume any time. Volcanic activity begins when a planet's internal heat causes a body of rock to become molten. Geologists call molten rock magma; it's a mix of silicate and other minerals, plus gases, including water vapor and carbon dioxide (CO2), that are dissolved in it. Magma rises because it is less dense than the surrounding rock. Moving slowly upward, magma will rise until its density matches the surrounding rock. This may occur at some depth within the planet, or the magma may rise all the way to the surface. If magma reaches the surface it will erupt, sometimes quietly, sometimes explosively. The most important ingredient in determining whether an eruption will be quiet and effusive (gushing), or violent and explosive, is the amount of gases and water dissolved in the magma. Basically, the more of these, the more explosive the eruption. Most Earth volcanism is basaltic. Basalt (bah-SALT) is an igneous rock rich in iron and magnesium minerals. It is usually dark gray or black. The most iron-rich basalts erupt at high temperatures and flow easily, like maple syrup. When magma has more silica in its composition, however, it moves stiffly, like cookie dough or peanut butter. Being thicker and stickier, high-silica magmas make it difficult for gas bubbles to escape smoothly once they form. Again, this makes explosive eruptions more likely. Volcanic eruptions on Mars have built numerous kinds of features. The main types of features are what scientists call shield volcanoes and flood basalts. These volcanic features also occur on Earth, although the Martian versions have some differences. Basalt flows are the most common kind of flow on Earth, and they are widespread on Mars as well. But because Mars is a smaller planet with less gravity and a thin atmosphere, its volcanic activity does not exactly match that of Earth. For example, the lower gravity (38% of Earth's) causes lava flows to travel farther, all else being equal. Flows also tend to go farther because the thinner atmosphere means they cool more slowly. In addition, the lower gravity and thinner atmosphere means that volcanic ash thrown from explosive eruptions likewise travels farther and spreads out more. No one has ever seen a Mars volcano erupt, yet scientists can look at the results of past eruptions and make calculations and predictions. For example, Martian basalt volcanoes could erupt a lot of volcanic ash in plumes shooting many kilometers into the sky. The ash would fall back to the surface over a wide area, building up layers of poorly compacted material. On the other hand, the erupting column might collapse and send a superhot cloud of ash and gases flying from the vent at ground level. When this mixture cools, it would leave a deposit of pyroclastic debris. On Earth, such eruptions come mostly from silica-rich magmas, not basaltic ones. But, on Mars, the lesser gravity would make such explosive eruptions more common. Scientists think that when Mars was young, explosive eruptions were more common than in recent eras. The oldest volcanic areas on Mars (the Circum-Hellas Volcanic Province) tend to have more loosely compacted materials such as ash than hardened lava flows. If more research confirms this finding, it says Mars experienced a major change in volcanic style in its past. The change meant that later magmas contained far less water.